In today's world it is increasingly difficult for non-integrated countries to be either economically or politically viable. It is simply not sustainable for countries to be isolated in their own bubble; those nations should overcome their competitive mindset and search for ways to cooperate with their peers. The Maghreb, in Northern Africa, is the perfect example of a region whose countries have been unable to find their way to a deeper integration. Only the most basic level of cooperation exists between the region's five countries - Algeria, Libya, Mauritania, Morocco and Tunisia - despite the fact that the Maghreb Arab Union was created more than 25 years ago with the aim of building a powerful economic bloc in the region. The region's potential is enormous, especially if its countries can work together. However, trade between the Maghreb countries represents just 4.8% of their trade volume, according to the United Nations Economic Commission for Africa - and it represents less than 2% of the sub-region’s combined gross domestic product (GDP), according to the World Bank. This region is one of the lowest-performing trading blocs in the world. If the five Maghreb countries were integrated, each would gain a minimum 5% rise in GDP. A report by the World Bank on economic integration in the Maghreb estimated that deeper integration, including the liberalising of services and reform of investment rules would have increased the per capita real GDP between 2005 and 2015 by 34% for Algeria, 27% for Morocco and 24% for Tunisia. Rather than focusing on the problems or even their roots - whether ideological or economical - the Maghreb countries should look at solutions. Why not take lessons from integrated regions such as Europe, the Gulf Countries or the Economic Community of West African States, all of which can be seen to some extent as successful cases of regional integration? To succeed in establishing a more fruitful and deeper integration, the Maghreb countries should work closely together with the aim of applying the five recommendations outlined below. 1. Implement the free movement of goods, people, services and capital. This starts with opening up borders between neighbours. The borders between Algeria and Morocco - the region's two largest countries - have been closed since 1994, and movement between them is only possible via daily flights between Casablanca and Algiers. It is crazy that goods need to transit between these neighbours via the French port of Marseilles when they could simply cross over by land. An effective and integrated infrastructure between the countries, especially railways and roads, will be key to the success of this objective - and it cannot be successful, of course, without the lifting of tariffs, trade barriers and quotas in order to have a truly single market. We should not forget that in order to implement the free movement of goods, the Maghreb countries should tackle the issue of harmonization of standards which will lead to better economic and political cooperation. The five member states should take advantage of the fact that they are trading heavily with Europe as an opportunity to standardize and harmonize many laws at the Maghreb level. 2. Security cooperation. The exchange of information at the highest level will create a safer region, thus attracting more foreign direct investment and more tourists. The region's backyard is too messy for the five countries not to cooperate in order to solve these problems. Investors are looking for political stability and security, and the cost of a lack of intra-regional cooperation is simply too high. 3. Made in the Maghreb. Maghreb countries can help each other on many levels. 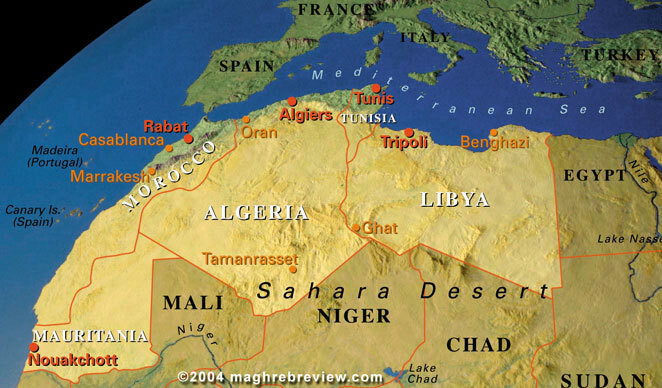 Internally, Algeria and Libya are resource-rich countries that can supply the needs of their neighbours. Tunisia and Morocco are agricultural and services countries and can answer the needs of their fellow Maghreb countries before they even think of exporting to Europe. At an external level, the five countries should export as a bloc. Until now, they have always competed against each other in sectors such as car manufacturing, textiles and services. However, the Maghreb countries already support each other in some areas, as is the case in the energy sector - where, for example, Morocco pumps in electricity from Algeria on Fridays and pumps it back on Sundays (Friday is day off in Algeria, whereas Sunday is a working day). 4. Cooperation with the South. The Maghreb countries should not turn their backs on sub-Saharan Africa, which for decades has been perceived by the region as a threat in terms of migration, crime and political ideology. However, today Africa is a land of opportunity and it can be the solution to many of the Maghreb's problems. Sub-Saharan Africa is a viable partner for sustainable economic and political cooperation. 5. Political integration. The Maghreb countries need to cooperate and produce a common social policy, especially in the areas of education, foreign affairs and even - why not? - common political institutions. This process should begin with the strengthening of the role of the Maghreb Union.